Last year on home soil at the World Championships, Great Britain dominated the paratriathlon events with six gold medals and a total of 15 podium finishes. They will return their goliath team with gold in their eyes in Edmonton. This year’s World Championships marks the first year the paratriathlon fields were limited to the most elite athletes in the sport classes, with the athletes having to qualify throughout the season in preparation for paratriathlon’s debut in Rio. In the women’s PT1 division, three-time World Champion and four-time European Champion Jane Egan (GBR) will have the chance to race for her fourth world championship crown. Only two other paratriathletes have garnered four titles. However, this year she will vie with the USA’s Mary Catherine Callahan, who has been sweeping up wins in PATCO races. Notably missing from the PTI lineup this year in the men’s race is four-time World Champion Bill Chaffey (AUS). Chaffey was on track to compete not only in Edmonton this week as well as at the 70.3 World Championships next weekend when his plans were derailed by a training accident that broke two bones in his pelvis. With Chaffey gone, the race is open for the taking. Although Geert Schipper(NED) has limited competition experience, he has won every race he’s done suggesting he is the wildcard to watch. The USA’s Hailey Danisewicz will headline the women’s PT2 category as the reigning World Champion. 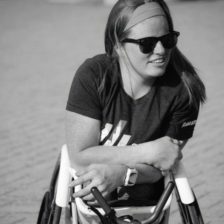 Newcomer Nora Hansel (GER), who’s raced in just two paratriahtlon events, has been spotlighted as Danisewicz’ biggest threat. Michele Ferrarin (ITA) has continued to fair well after claiming the men’s World TRI-3 and European TRI-3 titles last year, as well as collecting a win at the International Paratriathlon London event in the PT2 division this season. Look for Frenchman Geoffrey Wersy to put up a good fight in the PT2 division after placing second next to Ferrarin in London. Despite a sixth-place finish at last year’s World Championships, Brant Garvey (AUS) has shown potential with top finishes this season, as has Mark Barr (USA). With undefeated records this year, look for Saskia Van Den Ouden (NED) and Sally Pilbeam (AUS) to duke it out in the women’s PT3 sport class. Despite a 13th-place finish in TRI-3 last year in London, Jamie Brown (USA) owns the top seed in the men’s race heading into Saturday with two wins under his belt this year. Daniel Molina(ESP) picked up important racing experience from cities like Yokohama to London this year & will line up in Edmonton with the title on his mind. But both Oliver Dreier (AUT) and Alessio Borgato (ITA) blew past Molina at European Championships this year suggesting this will be a a battle down the finish chute. Although her undefeated recorded faltered slightly this season at the hands of compatriot Lauren Steadman, Faye McClelland remains one of the athletes to watch out for in the women’s PT4 category. She may have lost in season, but she still owns a perfect 4-0 record come World Championship time. Steadman, a two-time Paralympic swimmer, serves as McClelland’s stiffest competition with a swim that’s difficult to reel in. In the men’s race Stefan Daniel represents Canada’s strongest hopes of a medal in the paratriathlon races with a No. 1 start. But he’ll contend with a tough field including three-time World Champion Yannick Bourseaux (FRA). Bourseaux has been battling with rival Martin Schulz (GER) all season, as well as attempting to ward off the young rising talent Spain’s Jairo Ruiz Lopez. Schulz beat out Bourseaux last year, as well as twice this year despite his low starting position. Melissa Reid (GBR) and Susana Rodriguez (ESP) return after finishing first and second respectively to one another in 2013 to again race as the top women in the PT5 division. On the men’s side, the PT5 will be one of the most competitive races of the day. Aaron Scheidies (USA), who has only lost one race in his eight years of racing, will start as the favourite. The man that delivered Scheidies’ one loss was David Ellis (GBR), who won the TRI-6 category at last year’s World Championships and will defend his title in Canada. Add in Iain Dawson(GBR) to the mix and all bets are off. Paratriathlon will be contested on Saturday following the men’s U23 World Championship race and the elite women’s Grand Final at 3:45pm, with the athletes being sent off in waves. A live finish cam will be available for paratriathlon, as well as a highlights video later that day. Follow @triahtlonlive on twitter for live updates.